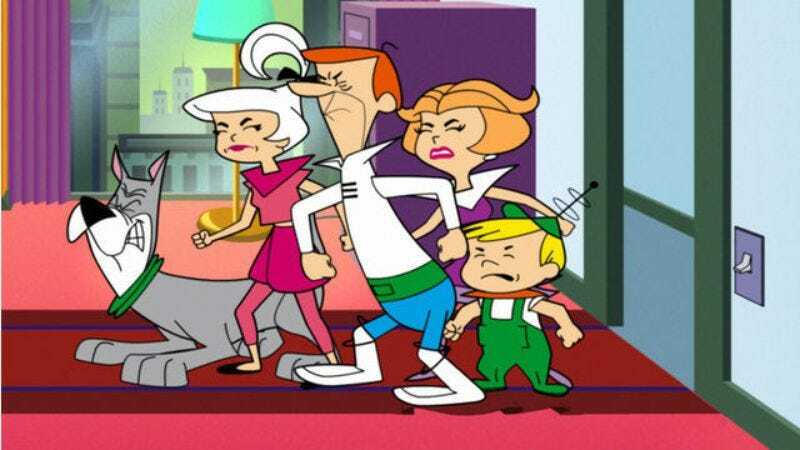 According to Deadline, Warner Bros. is taking another stab at making a Jetsons movie (well, a second movie). It last tried this back in 2012, when turning an old cartoon into a movie was simply a creatively bankrupt idea, instead of the only way movies are made at all, like it is now. The idea back then was to make it live-action, but apparently WB saw those Flintstones movies in the last couple years, because it has now wisely decided that this new attempt at a Jetsons movie will be animated. We don’t know much else about this Jetsons movie, but we can assume it will introduce us to a guy named George Jetson, his boy Elroy, daughter Judy, Jane his wife, and then the supporting characters who don’t get named in the theme song. Also, it’s being written by up-and-coming hotshot Matt Lieberman, who is also writing the Short Circuit reboot. The Jetson family even has a friendly robot that cleans up after them and sometimes dances and shoots lasers, so transitioning from that project to this one shouldn’t be too difficult for him.